The journalist Pamela Hutchinson is regularly writing about the history of silent film and its stars. For her column “Silent but deadly!“, appearing fortnightly in The Guardian, she has covered Clara Bow, Lotte Reiniger, and Rudolph Valentino. She also writes for Sight&Sound and Silent London. An interesting resource for any scholars of silent cinema! The Royal Opera House in London is staging Brecht and Weill’s The Rise and Fall of the City of Mahagonny as a parable on the current financial crisis. Philip Hensher has written an interesting background piece about the history of the opera in The Guardian. In March, the Konzerthaus on Gendarmenmarkt is hosting Festival Mythos Berlin, a series of concerts and events celebrating 1920s Berlin. The highlight of the festival is the European premiere of Marc Blitzstein’s 1928 one-act opera Triple Sec. Die Sünde des Lord Silverside. Unfortunately, the organisers have missed the opportunity to include the Konzerthaus’s own role in Weimar history as the backdrop of Gustaf Gründgens‘ career in the early 1930s – the subject of Klaus Mann’s infamous novel Mephisto. Carolin Dorothée Lange: “In diesem Sinne hat jede Zeit, hat jedes Volk die Führer, die sie verdienen” — Zum Politik- und Politikerbild des republikanischen Bürgertums in der Weimarer Republik. Michael P. Ryan: Fritz Lang’s Radio Aesthetic: M. Eine Stadt sucht einen Mörder. On the day of the last (at least somewhat) democratic elections in Germany, on 5 March 1933, the American journalist Cornelius Vanderbilt IV, heir to the Vanderbilt empire, apparently interviewed Hitler in the wings of the Sportpalast. Some scenes have resurfaced in this anti-Nazi movie from 1934. 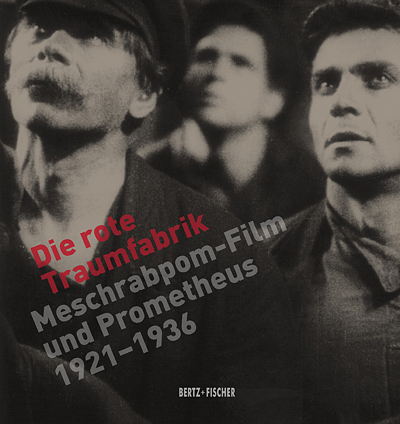 Accompanying the focus on Soviet film at last year’s Berlin Film Festival, this collection of essays on the Russian production companies Meshrabpom and Prometheus shines some light on the neglected topic of film collaboration between Soviet Russia and Weimar Germany.